First Published on Truthdig, December 2017. When I arrived at the Sonoma wildfire’s ground zero, I expected to find grief, rage, tragedy. Instead, I found a celebration of sorts–a coming together of three generations of a family that was simply grateful to be alive. Two National Guardsmen stood in the morning sun next to a camouflage jeep on the street corner next to a makeshift barricade. They were asking for ID, or in my case, a press pass. To the civilian mind, it looked like a war zone. But it was not. This was Santa Rosa’s Coffey Park, only 90 minutes from San Francisco, just west of Highway 101. This was one of the neighborhoods hardest hit by the recent wildfires. First came the hot wind. Then smoke, ash, flames–until everything was swallowed. Before the fires, Northern California seemed sheltered from the man-made and natural disasters that plague other parts of our country and our planet. But on the night of Oct. 8, this facade of safety came tumbling down, along with the roofs and walls of 8,400 structures. The fire took from the rich and poor alike, from the farmers, suburbanites and even the city dwellers. It swallowed 160,000 acres of Sonoma and Napa farmlands, decimated vineyards and crops, consumed entire communities. In the flats of the Santa Rosa Plain, Coffey Park was hit in the dead of night, when residents were in various states of slumber. Sparks from the Tubbs fire crossed the grasslands, incinerating the upscale Fountaingrove neighborhood before leaping the six-lane freeway, striking a commercial strip and finally roaring into Coffey Park, taking 1,300 homes. Fourteen days later, on Oct. 22, inside a small rectangle of rubble, a family worked with shovels, rakes and blue buckets: 10 adults and two children, three generations in boots, sneakers and white face masks—standing, crouching, walking, digging—sifting through the remains of a life. The Fulkerth family appeared to be the sole signs of life on a block that looked like it may have held at least 50 homes only days earlier. When the residents were first allowed back in (after the fallen trees and electric wires had been cleared), there was a line of 3,000 cars. Only two days later, the Fulkerths still were trying to salvage something. It was graveyard quiet, except for their voices and the crunching of metal, broken concrete and ash underfoot. A young blond woman in pink pants and tortoiseshell glasses that rested above her white face mask hunched over a sand tray—the kind they let children use at museums to pretend to be archaeologists. Can you imagine becoming an archaeologist for your own life? Days earlier, the smoke and ash from the fires had blown all the way down to Marin, Berkeley and San Francisco. For days, it had snowed black ash, spreading the noxious smell of burned plastic, burned asbestos, burned-up furnishings, insulation, roof tiles, toys, clothing, trinkets—all those tiny little things upon which we place such value, the objects that bring back a moment in time with a smell or a touch or a glance. As the firefighters struggled to put out the blazes, it became normal to see adults and children walking the streets in those white No. 95 face masks. Many people barricaded themselves indoors. But all of the alerts and precautions were put in place too late for the families in Sonoma, Napa and Santa Rosa. Too late for the Fulkerths. By Day 14, the air still smelled like a smoky dive bar, although now blue had come back into the sky. Driving into Coffey Park you pass typical American suburban yards: basketball hoops, plastic toys scattered across front lawns, small green squares of lawn, white picket fences. Cars parked in driveways. Kids playing ball, adults getting the mail, going to work, washing cars, pushing strollers. And, of course, there were yard fences. Gray wood slatted fences, metal fences, white plastic imitation picket fences. Brick walls. Concrete walls. Walls painted different colors: red, brown, beige, white. Shingled roofs. Windows. Doors. Those things that mark where one person’s property ends and another’s begins. The same kinds of dividers that 3-year-olds fight over after they learn the words “my, me, mine.” The kinds of lines that divide nations and so often lead to wars. In Coffey Park now, all these divisions are gone. You can see clear across the block from one side to the other, except for the broken concrete and metal parts sticking out of the gray ash: the bare frame of a bicycle wheel, the charred bones of a seatless patio chair, the skeletons of cars stripped of fabric. And there are chimneys. Lonely survivors, they stand next to the remains of the leafless, blackened trees, spines on a body ravaged by a terrible disease. Kimberly Fulkerth, an energetic, 55-year-old hospital worker, grandmother of eight and mother of five adult children, was tossing and turning on the night of Oct. 8, bothered by the violent winds. I found her in blue jeans and a gray T-shirt, digging in the remains of her old home, her long, blond-gray hair tied into a ponytail, black glasses atop her head, shovel in hand. At 12:30 a.m., after a few hours of restless sleep, Fulkerth and her husband, Jeff Fulkerth, 63, got up and looked around. At 1:30 a.m., they took action. When we looked outside it was really smoky. Then maybe five to seven minutes later there was a loud boom. The electricity went out, and we decided at that point it was time to put on our clothes and head out. We took three minutes getting our clothes on and deciding what we would take with us. We had a strongbox on top of our gun safe that had all our important papers, our passports, my marriage certificate, his birth certificate—you know, papers. I had my clothes on my back. I had my purse, my phone. We discussed whose car we were going to take. It wasn’t even an option separating. When we came outside, I couldn’t see anything. It was a blizzard of ash and smoke. I couldn’t see my car. A neighbor knocked on the door. “We had a phone tree,” Fulkerth told me. It connected all seven families in their court. This phone tree may have saved each of the families in the Fulkerths’ immediate area from the swift and brutal fire that took those who were too old or disabled, or too sound asleep to get out in time. Not only did Kimberly and Jeff Fulkerth have a phone tree, they had their strongbox, where they kept an emergency radio and all their important documents. Not everyone was so well prepared. “It was cataclysmic,” Fulkerth said. But unlike some of the neighbors who placed blame on the government, she didn’t believe in dwelling on the negative. Her can-do approach appeared to filter down to her entire family, who all conveyed an impressively pragmatic and grateful attitude. She already had called her insurance company, her contractor and the city of Santa Rosa. Everyone, she claimed, had been great, including the Google food truck, which had been feeding the neighborhood. 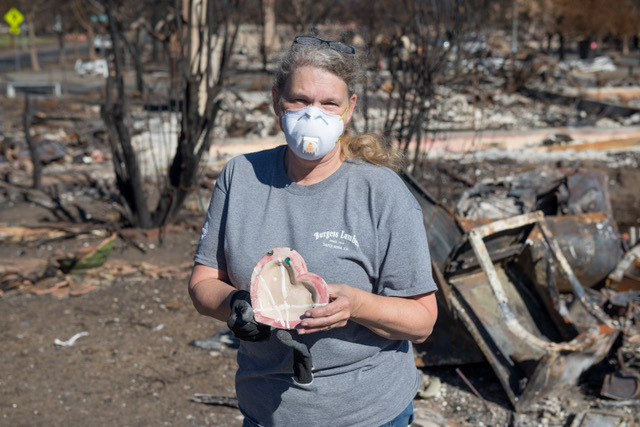 An imaging technician for Queen of the Valley Hospital in Napa, where her husband also works, Fulkerth was given time off by the hospital, along with some disaster relief, but she said she could not yet imagine going back to work. Pointing to a clear plastic storage bin, Fulkerth showed me a stack of old metal window counterweights that lay inside. “I keep finding these,” she said. “There are a thousand and one of those.” I imagined that when she brought these bins, she had envisioned filling them with a different kind of treasure. “I’m thinking of making some kind of hanging decoration,” she said, waving her arms in the air to amplify her vision. She planned to hang the broken metal hands of the antique clocks along with the window counterweights from the ceiling of her future home. Some people might cry, rail or rage against the world—but Fulkerth plans to transform her catastrophe into art. “Yes, baby, what’d you find?” asked Fulkerth. In the little girl’s gloved hands lay a perfectly intact, dusty pink, ceramic heart. “Hey! I made that in high school!” said Alexis, walking over to examine it. “You remember that one that was like the birds that I carved? I’m really sad about that one,” said Alexis. “What do you regret losing most?” I asked. Fulkerth and her husband took great pride in their home. It was the oldest in the neighborhood, a Craftsman, built in 1910, made of old redwood—a 2,400-square-foot three-bedroom with a bay window. Gone were her husband’s antique clocks (Jeff Fulkerth used to fix all the neighbor’s clocks when he wasn’t working as an X-ray technician at Queen of the Valley Hospital). Gone was her grandmother’s silver flatware. Gone (except for the gravy boat) were the 26 multicolored Fiestaware plates and place settings. Gone was her Russian grandmother’s Singer sewing machine from 1942, and her great aunt’s sewing machine from 1870, other than an ornate metal foot pedal, which Fulkerth placed in a stack of salvaged parts. The Fulkerths plan to rebuild as soon as the city is done with the cleanup. Unlike many renters or homeowners, the Fulkerths had a solid insurance plan, which they have been told will cover their rebuilding costs. Jeff Fulkerth, in jeans and a baseball cap, sat on the steps of their trailer, taking a break. In back of him was a burned-out old Volkswagen Beetle, the back lights melted as in a Dali painting. Next to him sat a plastic bin with a row of small clay figures laid out on top—Chinese mud men, made from a kind of clay that no longer exists. The statues were miraculously unscathed. Just covered with a coat of dust, many of the tiny carved details remained. The row of old bearded and mustached figurines lay in various postures, staring up at the gray-blue sky, their faces calm and sage. “How have you been coping?” I asked him. Sonoma County Fire Survivors are still rebuilding their lives. Want to help?